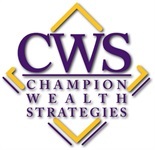 Champion Wealth Strategies is a full service Wealth Planning, Insurance and Benefits firm. We seek to build a reputation on helping clients create, preserve, and protect wealth for their families and their businesses. CWS provides personalized strategies to help professional athletes, affluent business owners, executives, physicians and retirees to pursue their financial goals and dreams. Our mission is to be a valuable, strategic partner contributing significantly to your success and quality of life by working with you to simplify the demands of managing your wealth.